words by Fiona Symington-Mitchell. Photos courtesy of Crown & Queue. When I first meet Adrienne Eiser Treeby, she is pondering the origins of cayenne pepper. Was it a late addition to the 19th century recipe that she is currently studying or an original ingredient? This is not a question that you normally find yourself being asked but then again this trained chef, cheesemonger and salumiere is someone who defies conventions. 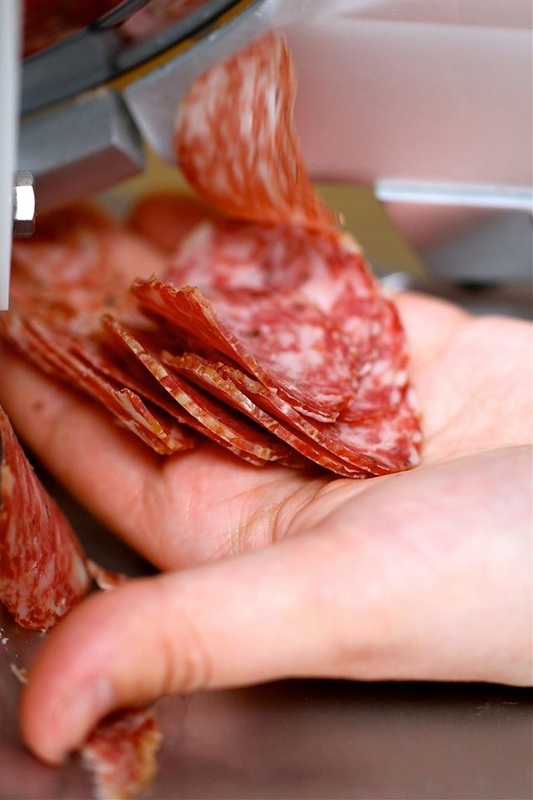 ​Trained in the northern Italian style of curing under master salumiere Kristopher Doll, Adrienne is in her own words the “managing director, pork whisperer and fearless heroine” behind Crown & Queue Meats, a British charcuterie business specialising in cured and preserved meats that opened in October last year. After years in professional kitchens, Adrienne apprenticed herself to Doll with whom she spent nearly three years being trained in the arts of curing and preserving. A life changing experience that saw her knee-deep in butchery, working with a master whom she described as “extraordinary, generous and talented with a breadth of knowledge and expertise”. Eighteen months in the making, Crown & Queue is now open with the name of her business a delightful play upon the more familiar coinage of nose-to-tail. As for the curing process it can take anywhere between four weeks to a year. 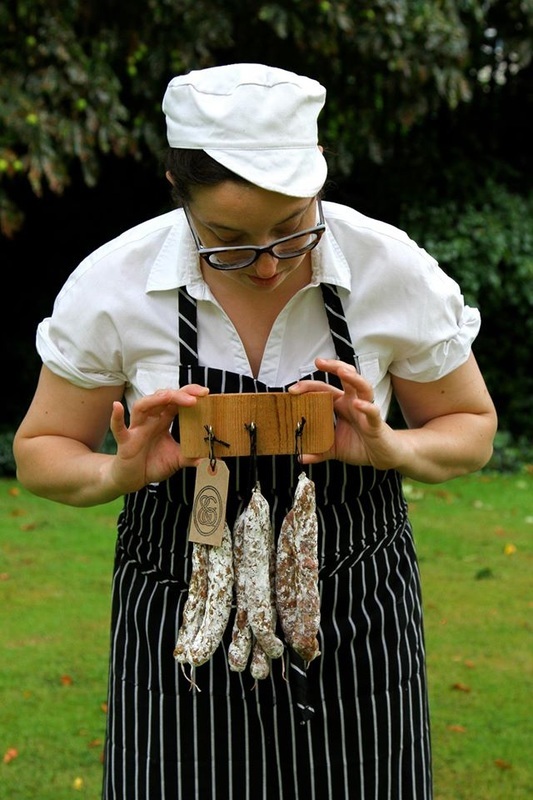 Of her cured sausages, Adrienne takes inspiration from British traditional classics such as plum bread and Victorian parlour games like snapdragon. Her preserved meats are a celebration of Britain’s rich preserving history using books such as the ruminations of Culpeper's Complete Herbal and A New System of Domestic Cookery by Mrs.Rundell to create her own recipes. Her preserved meats are only available on a Saturday at Spa Terminus. I really like the idea of challenging people’s preconceived notions of what British food is. When I started the business I couldn’t believe that there weren’t traditions around British curing. So I started buying up every old cookbook in the hope that I could find a recipe. Halfway through I thought let’s stop focusing on the recipes or ingredients that we don’t have and focus on celebrating the ones that we do. How have you developed your product range? 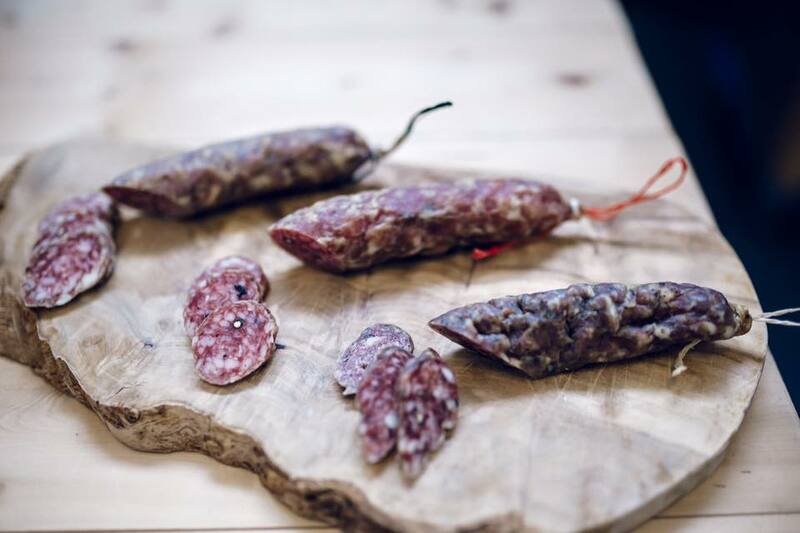 In terms of curing, I make four different types of cured sausages, all of which center on a local alcohol and use classic British herbs. I frequently take inspiration from different periods of time and history, so one of my sausages is based on Lincolnshire plum bread. It contains raisins, lots of garlic and sage and The Kernel Brewery’s Export Stout. Another is my recreation of the Victorian parlour game snapdragon. To play the game, dried currants were placed in a glass full of brandy and then lit. The first person to grab a currant out of the fire before it exploded was the winner. I use apple brandy made by Somerset Cider Brandy Company, dried currants, black pepper and nutmeg for this particular sausage. You are based at Spa Terminus: how would you describe it? l can’t tell you how amazed and in awe I am in being here. What people really need to understand is that Spa Terminus is very different from the other large food destinations in London. This is not a place that you come to buy lunch but is a hub of the very best produce that the city has to offer. It has a rigorous approval process for tenancy, including a three-stage interview, and so it is curated in the best sense. In its essence, Spa Terminus is about encouraging people to discover fresh produce, take it home and make something delicious with it. Kris Doll is right up there. This is a man that can take any animal, look at it and say we can make this. Mary Holbrook of Sleight Farm, Timsbury is incredibly inspiring to me. She is one of those women who not only has a faultless palate but is so capable, so strong, so unflappable. She has been making fantastic food forever. I also have to add M.K.Fisher, as she just reveres taste and sensation. 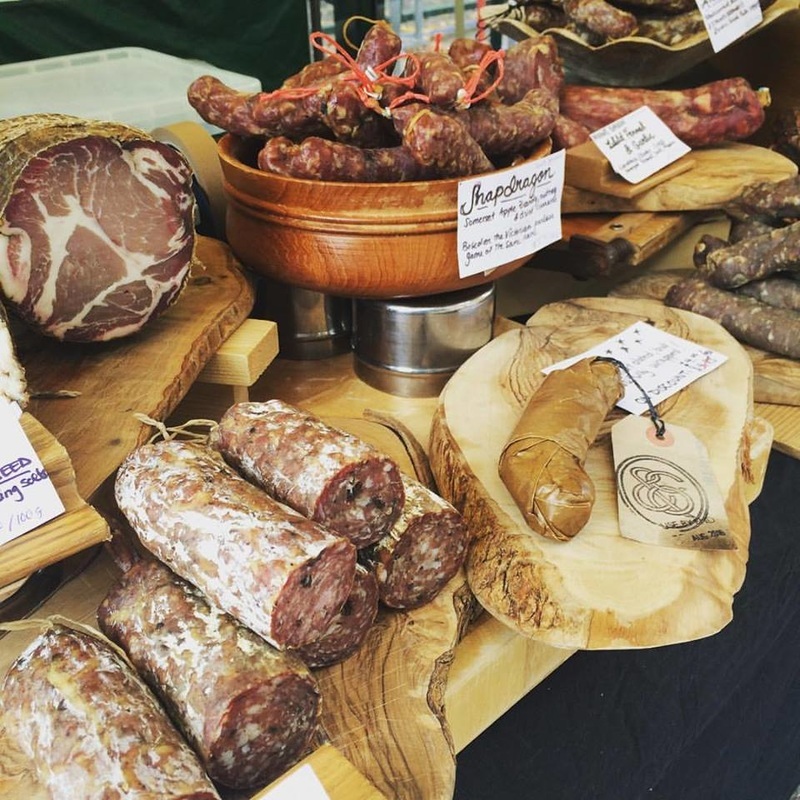 What’s in your London larder? I always keep a really well-stocked beer cupboard, including The Kernel Brewery, Brew by Numbers and The Five Points Brewing Company beer. In my larder, you’ll also find Colvin’s Hot Pepper Jelly, and some Graceburn cheese from Blackwoods Cheese Company. I try to always get my meat from The Butchery. The London Honey Companyand Natoora at Spa Terminus are other favourites. A London secret that you are prepared to share? Bermondsey Street. I have to say that it’s not getting the press that it deserves. There are so many great eateries there just waiting to be explored. I’d also say The Gingerline for a secret dining experience. Their events are truly amazing. You can find Crown & Queue at Unit 8, Spa Terminus Business Park, Dockley Road, SE16 3FJ. 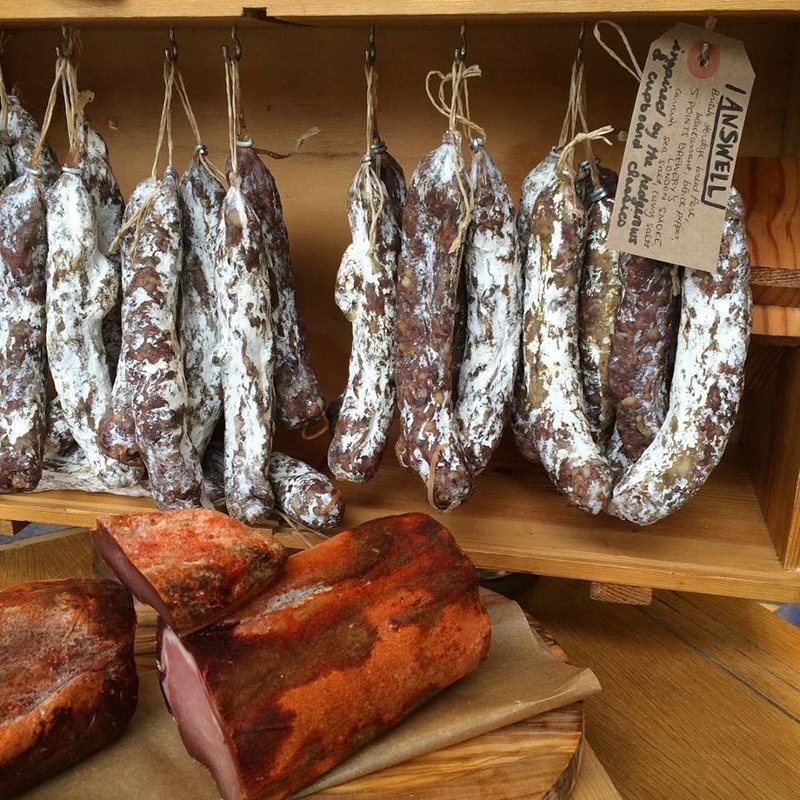 Adrienne can be contacted on enquiries@curedmeats.london and read about her adventures here.